PORTLAND, Maine — Workers were busy as bees the day we visited Maine Mead Works, housed inconspicuously in an industrial section of downtown. Inside the 800-square-foot space, two young men were bottling the signature blueberry mead, a caterer had stopped by to pick up a variety pack of the beverage for a culinary event at the Portland Art Museum that evening, and owner Ben Alexander was preparing his deliveries for the day. 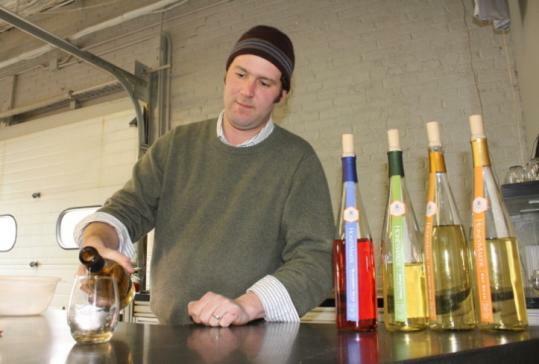 Those alone keep him busy — these days Maine Mead Works’ HoneyMaker mead is sold in 150 shops and restaurants throughout the state and shipped to more than a dozen states. If your notion of mead is a thick, syrupy liquid consumed at Renaissance fairs, Alexander would like to have a word with you. “People expect we’ll be serving mead in a skull-like mug that you need both hands to hold,’’ he said. “The perception is that it’s always cloying and sticky, something you only want a few sips of. But we’re one of the few meads that is really more like wine.’’ That includes the alcohol content of 12.5 percent. To help educate the masses, Maine Mead Works offers regular tastings and tours, where visitors can see every step of the mead-making process except the bees. Mead, “mankind’s oldest drink,’’ as Alexander, 34, likes to say, is a simple concoction made with 20 percent honey and 80 percent water. The honey, primarily goldenrod from northern Maine, comes from Swan’s Honey in Albion. Visitors can see where the mixture of honey and water, called must, is pumped into the fermentation room. Within 24 hours, 85 percent of the sugars in the must are fermented into alcohol. The process takes place in 5-foot-tall tubes (eight of them); production can be expanded by adding tubes. For now, the meadery can produce 500 to 750 bottles a week. After the must is fermented, it is pumped into maturation barrels, where it’s aged. The must-to-bottle process typically takes six to eight weeks, Alexander said. We were eager to taste the stuff, which comes in three varieties: dry, semisweet, and blueberry. Special flavors are made throughout the year, including one that was still on hand, the “applecisor,’’ made with apple cider instead of water. Other seasonal flavors include cranberry and lavender. As Alexander promised, the mead, served in nice glass tumblers, not Medieval-looking goblets, is closer to wine than syrup. The dry is a tad sweet, but not very, and the semisweet is just that. The plucky blueberry has a touch of tannin from the berry skins. We preferred the dry and semisweet, and bought several bottles for ourselves and friends. “These varieties will taste different in another batch because the honey changes from season to season,’’ Alexander said. I guess we’ll have to come back and see for ourselves. Free tastings and tours Thu-Sat 2-6 p.m. or by appointment (hours may vary seasonally). Bottles (750 milliliters) cost $14-$16.